Plan a weekend trip to Brattleboro to enjoy beautiful nature and unique attractions. Burlington is home to great restaurants, unique museums, attractions and lakefront parks. You can find an inn perfect for a romantic getaway, family vacation, or business trip, and there are options spread throughout Vermont, including those surrounded by nature and within walking distance of city attractions. When you think of New England, Vermont's fall colors, winter sports, and summer festivals come to mind. Vermont is a beautiful and unique wedding destination for those couples who want to come together with their family and friends in a memorable way. Killington is home to the largest ski resort anywhere in the eastern side of the country. When you think of Vermont, most likely you will think of traditional things such as maple syrup, beautiful fall colors, and skiing in the snow. Vermont is renowned for its vibrant fall foliage, skiing, and its delicious maple syrup, but the state also offers a host of excellent resorts that make for the perfect home base. 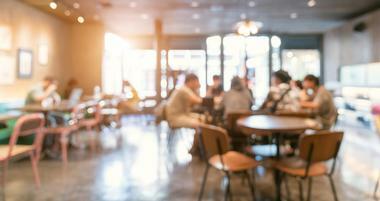 Finding a cozy cafe that strikes your fancy in Vermont is as reliable as their 120” Green Mountain snowfalls in winter, and the shade of their charming covered bridges in summer. 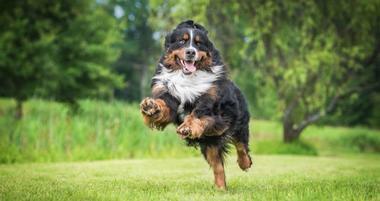 The Dog Mountain dog park in Vermont offers special events every year, like Dog Party and Dog Fest, and invites every dog lover to come and visit with their furry friends. 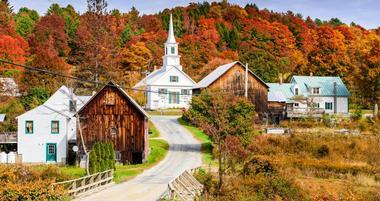 Vermont is a small state with many hidden treasures to offer tourists. The state is perfect for adventurers and outdoor enthusiasts. Most of the state is covered in forests and farmlands. 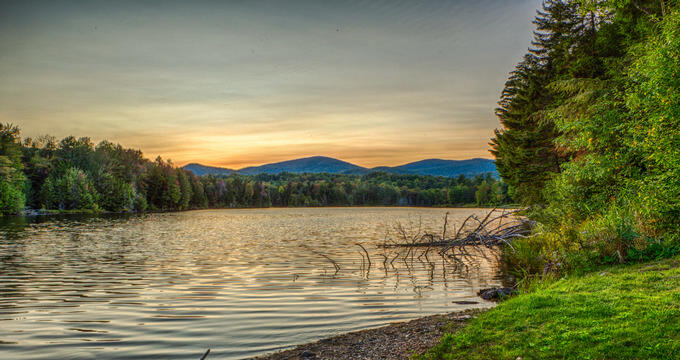 The terrain is hilly with crystal clear streams and lakes throughout and some of the best skiing in the country can be found in the state’s Green Mountains. The sprawling Lake Champlain attracts many visitors each year as well. Throughout the state you will find picturesque small villages, historical covered bridges and colonial architecture. Visitors to Vermont will certainly enjoy the picturesque scenery, small town charm, outdoor activities and of course delicious maple syrup. 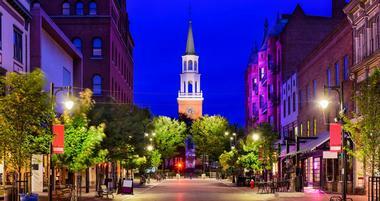 Burlington is Vermont’s most populous city and is situated in the northwestern part of the state on Lake Champlain’s eastern shore. The town has a downtown walking street that is closed to car traffic and offers a large number of restaurants and shops. Revolutionary War hero Ethan Allen lived here and his homestead is open as a museum. The Shelburne museum is a large complex to the south of Burlington which features several historic buildings filled with American folk and decorative art on display for visitors. Burlington is the largest city on Lake Champlain and offers easy access to the Lake Champlain Islands. Making it a popular jumping-off-point for those who come to enjoy the lake. Stowe is a year-round resort town in the north-central part of the state near the base of Vermont’s highest mountain - Mount Mansfield. One of the town’s largest attractions is Stowe Mountain Ski Resort, a popular winter sports destination. Most of the town’s points of interest and attractions are located in the historic village as well as along the Mountain Road leading to the ski area. The Vermont Ski Museum features exhibits related to the state’s skiing history and has a variety of old ski equipment on display. The Trapp Family Lodge, made famous by the Sound of Music is also a popular attraction. 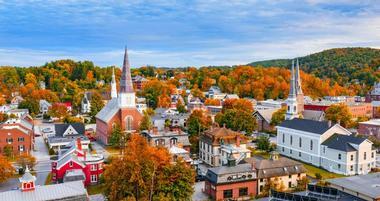 Montpelier is the capital of Vermont and has the distinction of being the least populated state capital in the country. There are less than 8,000 people residing in the city but many commute in for work each day. Both the Vermont College of Fine Arts and the New England Culinary Institute are both based here which give it a college-town vibe. Visitors to the city can tour the Vermont State House, a restored Greek revival capitol building that also has a significant historic art collection. In addition to the capitol itself, other attractions include the Vermont History Museum, Hubbard Park, nearby Fairbanks Museum and Planetarium, and Mount Mansfield. Woodstock is a small town located on the Ottauquechee River’s south branch. The town is known for its historical buildings and it looks much the same as it did more than a hundred years ago. One of the most popular attractions is the Billings Farm and Museum. The working museum farm tells the story of Vermont’s rural history and culture. The farm has a fully working dairy with Jersey cattle and is walking distance from the village center. There is also a meticulously restored farmhouse on site. Each year there is an annal Harvest Weekend festival held at the farm in October. Manchester is a small village and popular tourist destination. The village is popular for shopping as it has factory outlets of many popular retail brands such as Ralph Lauren and Brooks Brothers. Alongside these larger merchants there is a wide variety of local merchants such as the well-known Northshire Bookstore, frequently cited as one of the best independent bookstores in the country. 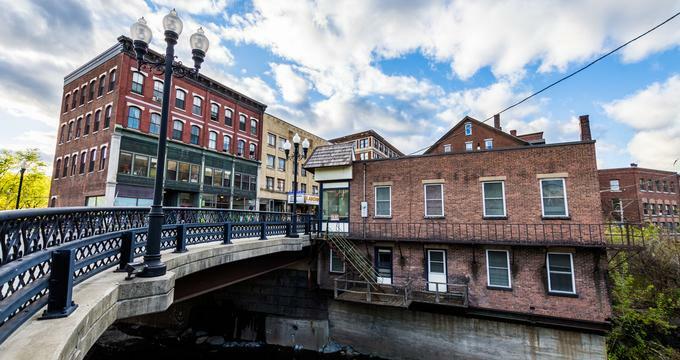 Other than shopping, popular attractions include the Southern Vermont Art Center, the American Museum of Fly Fishing, and the Museum of the Creative Process. Dana L. Thompson Memorial Park and Equinox Mountain both provide opportunities to relax and enjoy the outdoors. Bennington is a small college town in Southern Vermont. The town is home to Bennington College and has five covered bridges, giving it the classic Vermont country town feel. Attractions in and around Bennington include the Bennington Battle Monument which commemorates the famous battle that happened nearby and the Vermont Covered Bridge Museum which tells the story of these historical treasures. There is also a winery, golf course and plenty of antique shops in the village. The arts scene is alive and well in Bennington and the town’s Center for the Natural and Cultural Arts includes several galleries. For more arts and history, check out the Bennington Museum and the Bennington Potters. 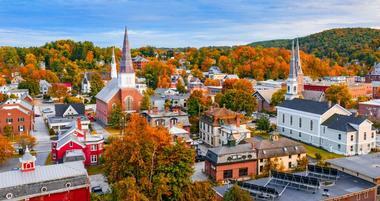 Saint Albans is a small city near Vermont’s Canadian border on Lake Champlain. The city is famously known as the Maple Sugar Capitol of the World and hosts an annual Maple Festival to celebrate its most popular export. The Maple Festival is held in April and features a wide range of maple flavored products including interesting ones such as maple cotton candy. Another annual event which draws many people to the area is the annual Bay Day Celebration which includes a popular triathlon. Attractions include the Weldon drive-in movie theater, the Northwest Farmers Market, Burton Island and Woods Island State Parks and Camp Kill Kare. For those who visit in winter, Hard’ak is a popular local winter sledding and ski hill. Colchester is located on the eastern shore of Lake Champlain just west of the Green Mountains. The town is home to Saint Michael’s College and serves as the base for the Vermont National Guard. Lake Champlain and other waterways are the biggest attraction in the area. Lake activities include paddle sports, boating, fishing, picturesque lighthouses and relaxing on the beaches and lakefront. The Lamolle River runs nearby offering further opportunities for fishing, kayaking and enjoying the water. Open seasonally, Niquette Bay State Park is a pet-friendly state park with a variety of hiking trails, scenic views and a beach on the lake. Mount Mansfield State Forest includes more than 44,000 acres of mostly forested lands and encompasses seven towns. The state forest property includes four state parks: Smuggler’s Notch State Park, Waterbury Center State Park, Little River State Park and Underhill State Park. Activities within the State Forest include a wide range of outdoors activities such as swimming, camping, hiking, hunting, fishing, boating, mountain biking, watching wildlife and more. The Waterbury Reservoir offers activities on the water including motored boat access and primitive lakefront campsites. There are two alpine ski resorts offering winter sports as well as a system of back country ski trails and more than 36 miles of snowmobile trails making for year round fun. Bennington Battle Monument is a more than 300-feet tall monument constructed in the shape of an obelisk from blue-grey colored limestone. The monument honors the Battle of Bennington which was fought in August of 1777 and is considered by historians to be a major turning point in the Revolutionary War. Many events are hosted at the monument each year including a reading of the Declaration of Independence, an annual 5K race, and a Living History Encampment among others. The onsite gift shop offers a selection of items related to the battle, the monument and products made in Vermont. They also have historical flags and other historical gifts. Queechee Gorge is a beautiful state park located along US Route 4 near many Upper Valley attractions. Many visitors come each year to enjoy the stunning views of the gorge which was formed by glaciers and the deepest in the state. The Ottauquechee River flows some 165 feet below the top of the gorge and is popular among kayakers. There are hiking trails that run along both sides of the gorge and offer scenic views. The park offers camping in spacious sites that can accommodate tents and large RVs. There are bathrooms with shower facilities and a playground nearby. During the cold months, many come to the park for cross-country skiing. Smugglers Notch State Park is a park in the Green Mountains near the town of Stowe. 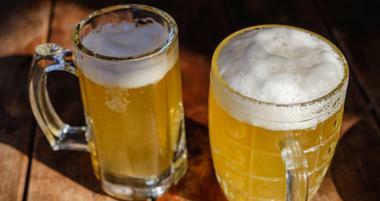 The name comes from the Smugglers Notch which is a dip separating Mount Mansfield from nearby Spruce Peak. During the early 1800s, the Smugglers Notch was an area where goods were smuggled illegally from Canada into the United States, thus resulting in the name. The park offers recreational activities year round. Hiking is a popular summer activity. Several trails lead from the park to the top of Mount Mansfield and mountain climbing the mountain’s vertical cliffs, bouldering and spelunking the park’s many caves are all permitted. In the winter, the park is only open for skiers and snowmobiles. Overnight accommodations include fourteen lean-tos and twenty sites at the campgrounds. Moss Glen Falls is a 125-foot waterfall on Moss Glen Brook near the town of Stowe. It is one of the tallest waterfalls in the state has has several tiers including several impressive drops. The majority of the waterfall is inaccessible without the use of rappelling gear. The gorge is quite deep and the edges are quite sharp which makes it difficult to get a view of the falls from above. However, there is a hiking trail from the parking lot which takes guests to a scenic overlook with a good view of the fall and then leads around the rim of the gorge. Mt. Philo State Park is a 217-acre state part which preserves and protects the area that surrounds Mt. Philo. The park offers scenic views of the surrounding Green Mountains, the Adirondacks and Lake Champlain. There are hiking trails that lead to the summit of the mountain. The peak has a picnic area where you can enjoy the beautiful views of the mountains and lake. The park is popular among bird watchers who come to see falcons, hawks and other raptors. For those who wish to stay overnight, the park has a small campground with three lean-tos and several tent sites as well as hot showers and bathrooms. Camel’s Hump is the third tallest mountain in the state and is the highest peak that is still undeveloped. It is the centerpiece of Camel’s Hump State Park and part of the Green Mountain range. The profile of the mountain is easily recognizable and appears on the Vermont State Quarter. There are several trails that lead up to the summit including the Burrows trail which is the most popular. Burrows is also used in the winter for skiing and snowshoeing. The peak offers views of mountains as far away as Mount Marcy in New York and Mount Washington in the state of New Hampshire. Jamaica State Park is a 772-acre park situated on the shore of the West River. The park offers a wide range of recreational activities including hiking, mountain biking, wildlife watching, boating, swimming and fishing on the river. Hamilton Falls Natural Area is located within the park and features several scenic waterfalls with hiking trails. Overnight accommodations include camping at one of 43 tent or RV sites, as well as lean-to shelters. The campground features hot showers, bathrooms, firewood and ice. The park has a nature center which offers educational programs, guided hikes, campfires and activities for children. Grand Isle State Park is a 226-acre park situated on the shore of Lake Champlain. The park offers a boat ramp for launching watercraft and many opportunities to enjoy the lake and the lakeshore including swimming, boating, fishing and a variety of water sports. Other activities include hiking, bicycling, wildlife watching, picnicking and winter sports. There is a staffed nature center that has regular educational programs for the entire family including guided night hikes, campfire programming, nature crafts and games. The park offers overnight camping with both tent and RV sites as well cabins and lean-tos. The campground features a sanitary station for RVs and restrooms with hot showers. Emerald Lake State Park is a 430-acre park in East Dorset. The park’s centerpiece and namesake is Emerald Lake, aptly named for its striking emerald color. There are a variety of recreational activities available to visitors including swimming, boating and fishing in the lake, hiking, picnicking, mountain biking and admiring wildlife. The lakefront has a small swimming beach that offers boat rentals as well as a snack bar, a horseshoe pit and picnic facilities. The park has campsites and lean-tos with amenities such as toilets and hot showers. The staff at the nature center offer a variety of programming each day including crafts and games for children. Missisquoi National Wildlife Refuge is a wildlife refuge in northwestern Vermont on Lake Champlain’s eastern shore. The refuge offers activities year-round which include wildlife viewing, hunting, photography and educational programs. The refuge is home to several species of migratory birds. At various times throughout the year guests can see wood ducks, bobolinks, and heron in the park’s wetlands, bog and woodlands. You may even get a chance to see a nesting bald eagle. There are five trails which altogether provide 7.5 miles of hiking paths to explore the refuge’s habitats. Small boats, kayaks and canoes are permitted in areas where trails do not reach, offering visitors a different view of the refuge. Burton Island State Park is a state park in the northwestern part of the state. The park is made up of Burton Island which is a 253-acre island in Lake Champlain off of the coast of St. Albans. The park’s marina offers 100 boat slips and additional boat moorings are available. The marina has a holding tank, pump-out facility and wireless internet. Canoe and rowboat rentals are also available. The island has three miles of shoreline that features swimming areas and picnic grounds. 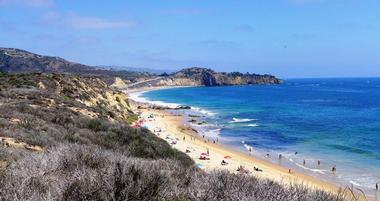 Hiking is also a popular activities with several miles of beautiful hiking trails. There is also a nature center, small museum and a small store. The island is accessible only by boat and a public ferry travels round trip from Burton Island State Park to Kamp Kill Kare State Park several times a day. Lake Champlain, the country’s sixth largest lake is a popular tourist destination. 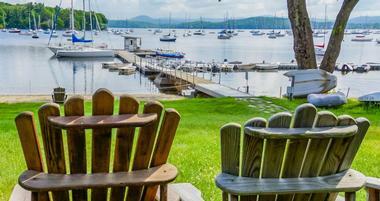 The Lake has approximately eighty islands, several of them containing entire Vermont towns. The largest island is South Hero Island which has the town of Grand Isle and South Hero. Three of the islands are linked by bridge to a peninsula offering easy access from Burlington. This string of islands is 28 miles long and only about 4 miles wide. The islands offer a myriad of recreational activities and ways to enjoy the lake as well as stunning views of the lakes and the Green Mountains. A few lodges offer overnight accommodations on the islands, and camping is also readily available. Creamery Covered Bridge is a historical bridge and the last surviving covered bridge from the 19th century in Brattleboro. The bridge is a lattice truss design that was patented by prominent architect Ithiel Town. It was built in 1879 and is constructed from spruce lumber. It sits just to the west of the town of Brattleboro. The bridge is open to foot traffic only as it was closed to cars in 2010. Its proximity to Route 9 and status as the only remaining covered bridge in this area make it a popular tourist attraction among bridge enthusiasts, history buffs and photographers.